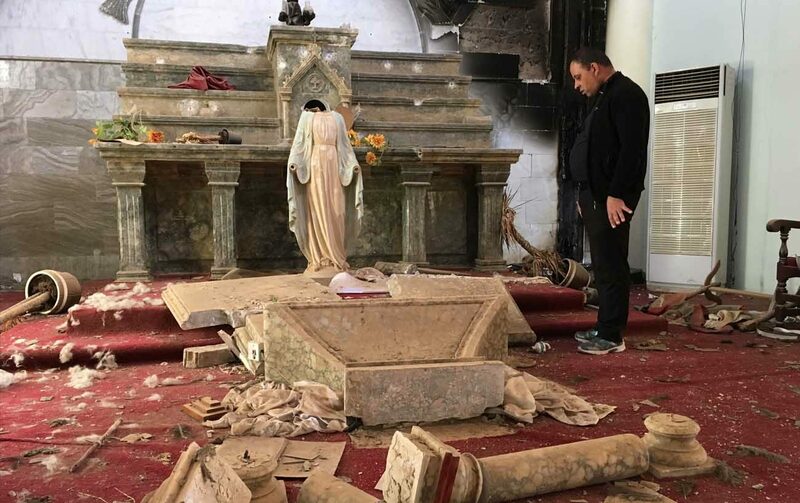 WASHINGTON (CNS) — In 2014, the Islamic State removed hundreds of families of religious minorities from their homes in Karamdes, a mostly Christian town on the Ninevah Plain in Iraq. Just over two years later, the town, also known as Karemlash, was liberated. The Knights of Columbus will raise $2 million to assist these families in returning to their homes, according to Knights CEO Carl Anderson, who announced their pledge at the Knights’ 135th annual Supreme Convention being held Aug. 1-3 in St. Louis. The Knights are following the example of the Hungarian government, whose new spending bill allowed for $2 million to be sent to the Archdiocese of Irbil in Iraq, assisting with the rebuilding of a Christian community near Mosul, Iraq. Families who were previously displaced from their homes were able to return to their homeland because of the government of Hungary. This example served as proof to the Knights of the impact of returning families to their homes. The cost of resettling one family is around $2,000, the amount the Knights are encouraging councils, parishes and individuals to donate. The Knights have actively sought to provide humanitarian aid to Christians in Iraq, as well as Syria and the surrounding areas, donating over $13 million. In June, Anderson joined Rep. Chris Smith, R-New Jersey, and Rep. Anna Eshoo, D-California, in speaking in a news conference to urge the Senate to pass legislation that would provide U.S. humanitarian aid to the Archdiocese of Irbil, after the House unanimously voted in favor of the bill. Pope Francis commended the Knights for their work in the Middle East in a letter sent to the Knights at the convention from Vatican Secretary of State Cardinal Pietro Parolin. The pope professed his “gratitude for the commitment of the Knights to supporting our Christian brothers and sisters in the Middle East,” according to the letter. In a news conference July 27, Secretary of State spokeswoman Heather Nauert reaffirmed the use of the word “genocide” to describe the situation of Christians and other religious minorities in the Middle East. “When we look at Iraq and we look at what has happened to some of the Yezidis, some of the Christians, the secretary (Rex Tillerson) believes, and he firmly believes, that that was genocide,” Nauert said. In March 2016, then-Secretary of State John Kerry first declared that that ISIS militants’ actions in Iraq and Syria against minority Christian, Yezidi and Shiite Muslim groups was genocide. The Knights of Columbus also will join the U.S. Conference of Catholic Bishops for a “Week of Awareness” for persecuted Christians, which will begin Nov. 26 with a day of prayer for persecuted Christians. “Our work has truly changed history,” Anderson said. The work to rebuild Karamdes will begin the first week of August and any funds raised will go directly to the project.